It has taken me a full two days of work since the U.S. soccer team’s elimination from the World Cup for me to be able to process and rationally analyze what transpired over a few weeks in Brazil. In short, I really wished we had played better. The positive, cheery, we-should-still-be-so-happy attitude toward our performance, adopted by many fans and reporters, seems unjustified and wrong to me. Picture parents genuinely telling their unathletic teenager that he can make it to the NBA if he just keeps practicing. It’s not disturbing that parents or the U.S. fan base are positive and supportive. It’s disturbing that we don’t demand more of our teams over the years, that we aren’t able to recognize how poorly we actually played. As coach Jürgen Klinsmann said in his final World Cup interview, “[the players] need that sense of accountability, a sense of criticism, and people around them care about it.” The incredibly positive reaction to the team’s showing—accompanied by the resigned sigh that many people won’t be interested in soccer again until the next World Cup—was frustrating for those of us who see our teenager as he is: Not good enough. This team does not have good enough players or the right attitude to compete in the later rounds of the World Cup, and the only reason we seemed to be a threat was Klinsman’s “everybody defends, nobody attacks” game plan anchored by our brick wall in front of goal, Tim Howard. What we need is a new team with different players who are good enough to embody a different philosophy, a different, more loose, style of play that would allow us to actively participate in games for the full 90 minutes, rather than only waking up to attack in the last fifteen desperate minutes of overtime. We need to be honest with ourselves, because American soccer is no longer a small child just happy to be alive and advancing out of the group stages. We expect more now, and we can be honest about this team’s current quality. As an American, I am proud of them. But as a lover of soccer I am not. Along with a growing number of Americans, I am, in the words of Uruguayan writer Eduardo Galeano, “a beggar for good soccer.” I am inspired by it, not just athletically, but artistically, intellectually, and culturally. Teams and players become the muses that help me dream and write and appreciate life. This may seem ridiculous due to the supposed triviality of sport—my grandfather certainly wouldn’t understand–but sports matter, and times are changing. Soccer is growing in America, and for those of us who love the game, it provides a certain kind of euphoric relief from those sports that stop. Every. Five. Seconds. For. A break. Brought to you by Coca-Cola ©. Soccer is a fluid, ever-moving poetic expression of the human soul, of the futility of getting things done—we have to use our feet? !—of man’s variegated relationships with an object that is difficult to control and of our relationships with each other, as the pitch becomes an urban landscape, a fertile field, and the children playing on those surfaces become an international spectacle watched by millions. The relationships of life and of soccer are really about touch, which can be a dribble, a lofted pass, a strike, a smile, a kiss. These are subterranean ideas flowing through not just European and Latin American but United States of American veins during the World Cup, more gallons of it in this tournament than ever before. In a nation where soccer is the third or fourth sport at best, the attention we are giving it this month means something more: To embrace soccer, an American must be open to new cultures and the passion for a set of styles, rules, and customs that can’t be found at home. It means seeing colorful people going nuts on Copacabana beach in Brazil and thinking: Wow, that’s cool, instead of dismissing it as foreign, bizarre, un-American. The media has aided the process of opening us up to soccer’s beauty. The analysis and features on ESPN and articles in our newspapers have led to more striking signs of soccer spreading such as the questions asked by our friends and strangers who see our jersey’s and t-shirts at work and at the bar and playing basketball in the park: Did you see the game yesterday? It was pretty crazy, is soccer always like that? When’s Brazil’s next game? Who do you think is going to win it all? These conversations are becoming more animated, more sophisticated. Even the people who feel like they know nothing about soccer are intrigued. And this is how we know that soccer in the U.S. is no longer a precocious infant. It is at least a teenager who can take criticism, reality-checks, and the message: We expect better. You must help yourself. If you don’t, there might not be anyone around to care about you in a few years. To be perfectly honest, all I could think about after the U.S.’s thrilling extra time loss to Belgium was: If f***ing Chris Wondolowski had just tapped the ball into the open goal at the end of regulation, we would be celebrating in the streets. All anyone would be talking about is how we might go about smothering the brilliant little flea that is Lionel Messi. F***ing Wondolowski. But that isn’t a fair or useful story for the match, and it disregards the incredible effort that the American players, including Wondolowski, put forward against Belgium and against each of their other opponents. And look who those other opponents were: We have to celebrate the fact that we came second out of four elite teams in the Notorious Group G. We survived the “Group of Death.” This was almost expected at home with the growing attention people are giving to soccer, but it really was incredible that we got better results than Portugal and Ghana, both of whom are arguably much stronger teams than the U.S. In comparison with the NCAA tournament, we were like a 5-seed going into the tournament but with a 1-seed, a 3-seed, and another 5-seed in our group. And we still made it to the Sweet Sixteen. 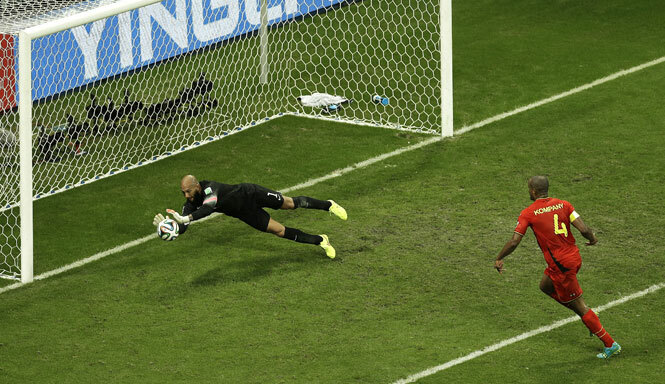 Superman Tim Howard almost saving the U.S. from the Belgian onslaught. The biggest positive of this team was its ability to defend, never letting in more than two goals to high quality competition. Goalie Tim Howard was more God than man, the heroic protagonist of the team, a rare honor for a goalkeeper. The U.S. was also able to score in all but one of its four games, another positive sign. There were moments of brilliance from the veteran leaders such as Clint Dempsey’s opening minute goal, Michael Bradley’s deft passes, and Howard’s hockey goalie heroics. The youngsters stepped up too with John Brooks’ crucial game-winning goal against Ghana, DeAndre Yedlin’s darting runs against Belgium, and Julian Green’s finish of a perfect Bradley pass in the team’s last period of soccer. The U.S. have a relatively strong, young core that should make for our best men’s national team ever in 2018 if everything goes according to plan. I think it’s a mentality topic that we have to break through in a certain way because the interesting thing is every time we go down a goal, we shift it up. Then suddenly we build the pressure higher up and give [our opponent] a real good game. There’s still this sense of too much respect often. Klinsmann described the Belgium game perfectly, when it took a Belgian goal, which quickly became two goals, for the U.S. to stop playing tight and unadventurous football. 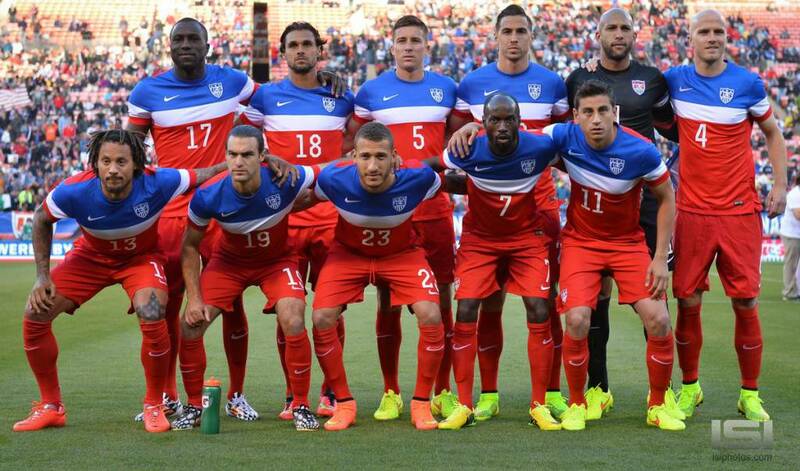 The Americans gave the Belgium team way too much respect for most of the game, and it cost us. We will know we’ve made it to the elite ranks when the team can come out and play with attacking or counterattacking confidence from the get-go. The first 105 minutes of the Belgium game were entirely devoid of creativity for the U.S. side. Some of that surely has to do with the loss of striker Jozy Altidore in the first half of the first game to a hamstring injury. Chris Wondolowski put forth a valiant effort but simply does not have Altidore’s class, and Dempsey and Bradley were forced to play out of position. 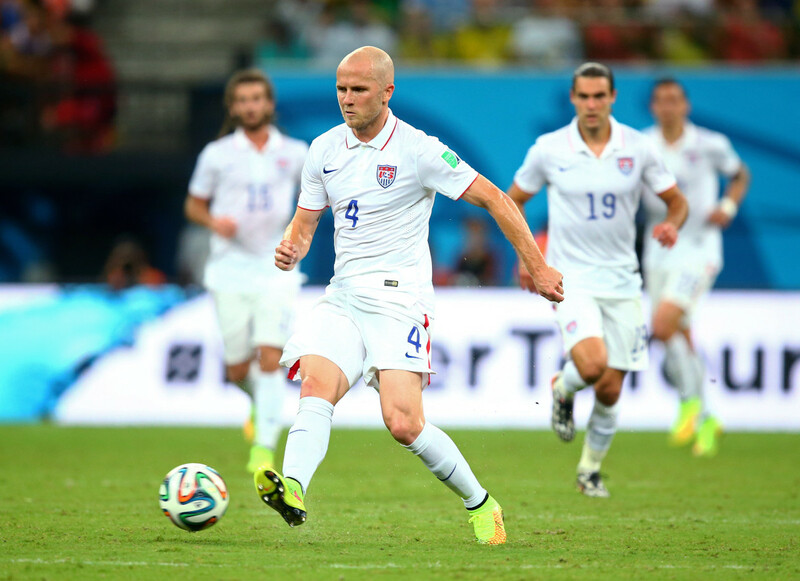 Michael Bradley had a rough World Cup. Many analysts and fans have rushed to Bradley’s support during the tournament. They point to the incredible stat that the midfielder has covered more distance than any other player in the World Cup and that he has had sublime moments of skill such as the pass to Green against Belgium. However, as we return to Klinsmann’s desire that we take an honest, objective approach to the team’s play, we must conclude that Michael Bradley’s World Cup was incredibly disappointing. His turnovers, his absence from long stretches of matches, and his inability to provide the creative spark that this team badly needs, mean that the negatives outweigh the positives for the U.S. team’s best player in this tournament. Perhaps too much pressure and responsibility was put on the 26-year olds’ shoulders. It isn’t that Bradley shouldn’t be on the team. He is undoubtedly a starter and will likely keep his spot in 2018. But he is not good enough to be the player through whom the offense runs, and he cannot be the guy we look to for playmaking. He is not a viable number 10 at this level. This World Cup showed that, and the U.S. will have to hope that someone else or perhaps multiple players can come along in the next four years to assume that role in 2018. Thinking ahead to the U.S. team of 2018, Bradley, Yedlin, Altidore, Green, Brooks, and defenders Fabian Johnson and Geoff Cameron will all likely continue to play major roles. Their individual progress will determine whether or not the U.S. can become a high quality team with an offensive identity, most likely defined by a methodical counterattack. If identity formation and an increase in quality and offensive chemistry do not occur, we can except another first or second round exit and another article about not treating teenagers like infants, from me. For now, we can enjoy the last week of great soccer and dream about the day when we can finally watch our American boys playing in these enormous matches. I do align with other analysts in backing Klinsmann’s belief that “Overall, we’re going in the right direction.” Here’s to a good World Cup and many more and better results to come. 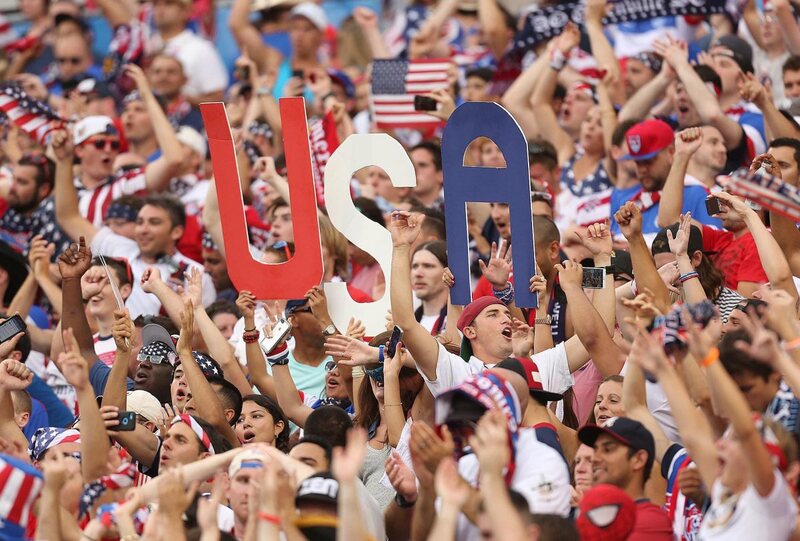 To Brazil and Back: A Roller Coaster Ride with the U. S. of A.